It's easy to forget when walking room by room through the carved magnificence of an opulent stately home, or craning your neck when trying to pick up some detail of a carved stone boss high up in the cathedral space, that the use of plants in ornamentation is by no means the preserve of these buildings. We are, in fact, surrounded by plant images the whole of our lives - in every city or town we visit and in every room we enter, an image of a plant in one form or another will be present. Subliminal advertising apart, it is good to know that man's obsession with flora is as strong now as it has always been. My own obsession with floral carving, plant form and structure has increased over the years, due mainly to an improvement in my drawing and painting skills. This has led to a parallel increase in the technical skills of carving and modelling through technique and practice, which hopefully means a far more satisfying and technically superior result. It has also kick-started an interest in art sculpture and carving, and the need to explore past and current works in galleries, museums and churches. A fascinating subject to read up on is the link between the golden mean - the number 1.618 (Phi) produced from the Fibonacci series of numbers - and its link with nature. Fibonacci spirals are present in sunflowers, pinecones, vegetables such as cauliflowers, and very interestingly in the leaf arrangements of trees such as oak, elm, lime and cherry. In the Renaissance period, geometrical shapes using the Golden ratio were used extensively in buildings and architecture as they believed, and we still do I think, that this ratio produces very pleasing forms. 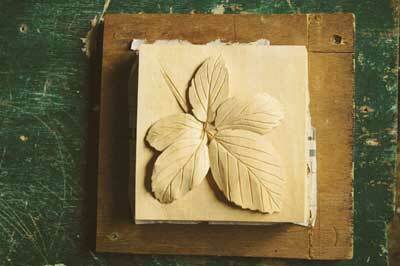 For this project, I have decided to carve some bramble leaves. Do a series of quick, lively sketches. Focus on the stem and veins of the leaves, and be aware of the negative spaces between them. Think about the structure of the leaves and the skeleton - don't get bogged down with the outside shape. 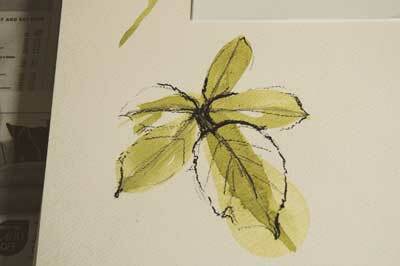 I used a chisel-ended paintbrush with watercolour paint to capture the movement of the leaves in a couple of strokes. With a minimum use of the charcoal stick, and starting with the veins, I quickly laid down enough information to allow me to get started. Next, place the leaves onto a flat surface and look at the relationship that they have with this surface, as it will help you with the design. My charcoal drawing shows the thinking process of trying to understand how the concave and convex shapes of the leaves are started. High and low points are shown. From your sketch work, you should be able to produce a line drawing of what you feel should be the final design. 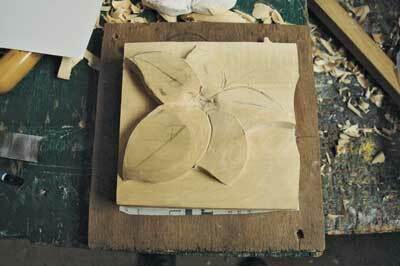 Use a suitable piece of the lime, at least 38mm deep, with no obvious figure, as it gets in the way of the carving detail. 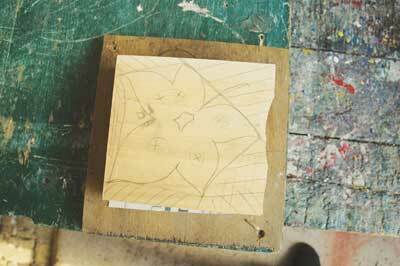 Trace the line drawing onto the wood and redraw accurately. High points not to be carved are marked with an 'x'. A base line is drawn around the outside of the piece of wood, and an arrow defining the direction of the grain is marked. 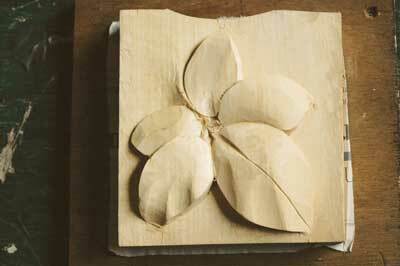 Vulnerable leaf tips are linked together and carved as one, for additional strength. 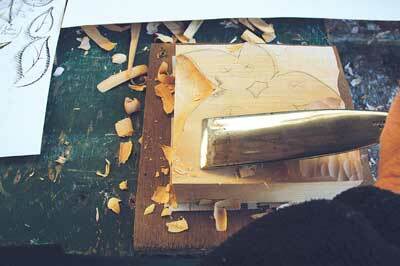 Using a very sharp scooped gouge, chop out large sections of the background wood. 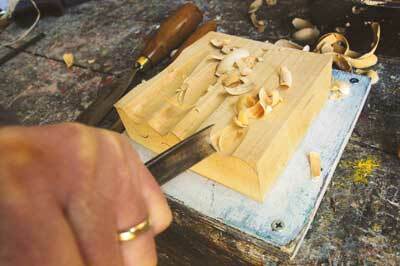 The shape of the gouge protects the carving edge, so be bold, but always in control. 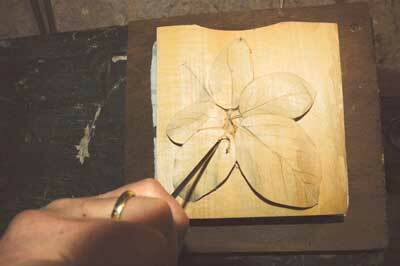 Using a large gouge, turn over and shape the leaves. 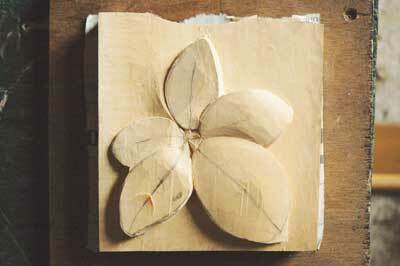 As part of the design, and to remove any short grain problem, carve vulnerable leaf tips down to the base line. A helpful tip is to lay a straightedge onto a curve - this will show you the shape of the curve and how it falls away either side of the edge. The two main things that you would know about the carving at this stage are the high points and the low points - everything else is in the middle. Scoop out a hollow where all the leaf stems join - this is the starting point. 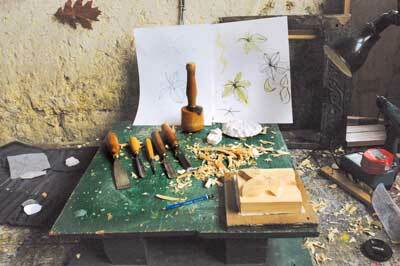 Using shaped gouges that fit the leaf shapes, start setting in the outside leaves and at the same time, tidy up the base. The main thing to be aware of when setting in, is to chop down straight at 90° to the base, with no undercut. 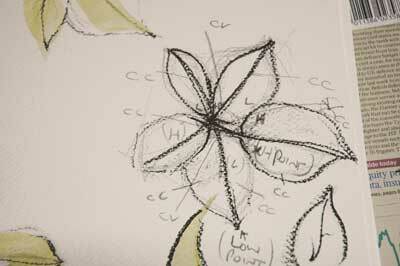 Using a small 'V'-tool, start separating the leaves, but not removing the pencil line of the dominant leaf. 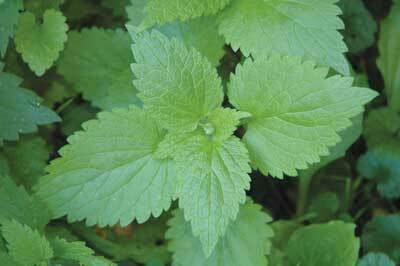 This has the immediate effect of placing one leaf lower and behind the other. 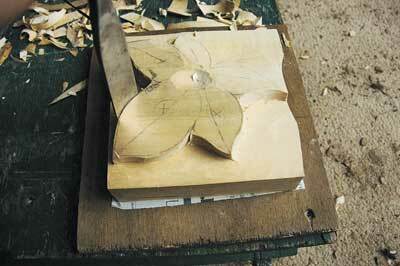 Reshape the lower leaf using the No.1 or similar smaller gouge. Redraw all the leaf centrelines and reinstate the junction where the stems will meet. Go back to your original drawings or leaves and study how the junction area works. The structure is small and delicate, so to try and emulate nature is probably not a good idea - using different angled chip cuts to introduce shadow is enough. Don't lose sight of the fact though that whatever you do, the shadow lines should all flow together in a pleasing manner, and not be too straight or disjointed. Referring back to your original drawings and any real leaves you are able to study, it is now time to introduce some flowing convex and concave shapes to give the carving some liveliness. 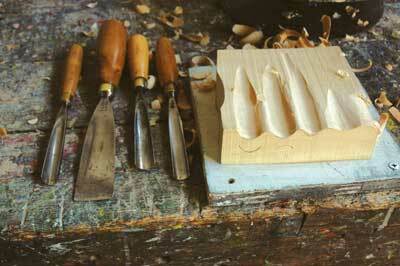 Using the No.11 gouge, keep looking at the whole carving from all different angles and planes whilst carving boldly. If unfamiliar with this technique, one idea to try is to gouge a line of concave shapes side-by-side, about 6mm apart, then using the No.1 gouge, turnover the middle section of wood between them. The edge profile should then look like a sine wave or 'S' shape. Use different parts of the gouge to change the profile of the curve, i.e. the flat side for shallower curves. Another idea is to practice the leaf separation stage. 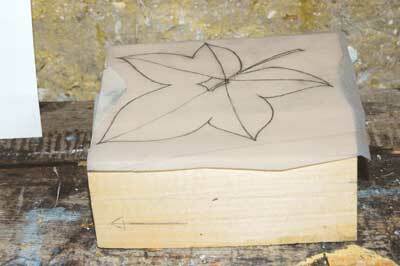 Chop out a few joined leaf shapes, separate with a 'V'-tool and then using the No.1 gouge, par a leaf into a convex shape, starting at the centre vein of the leaf and radiating out to the leaf edge, into the 'V'-cut. With a sharp gouge you should be able to cut cleanly and not be affected by the grain. 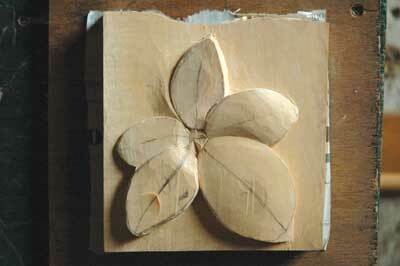 In my opinion, the convex and concave modelling is the most important stage, and can make or break a piece of carving. Spend some time looking at, drawing and photographing some of the magnificent foliage carvings in our churches or stately homes. Try to see and understand how this type of modelling was executed. 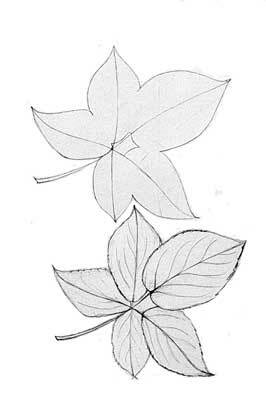 Carefully redraw the leaves with all the veins present. Tidy up the chip cut centre section. 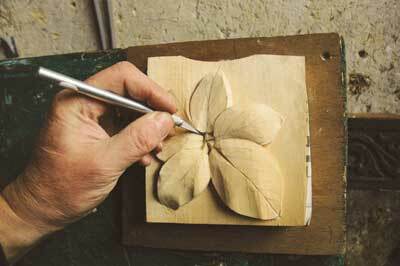 In a controlled manner, carve the centre veins of the leaves from tip through to the junction. Don't be frightened to run the veiner all the way outside of the leaf edge structure into the stem junction, cutting into this delicate chip cut area. 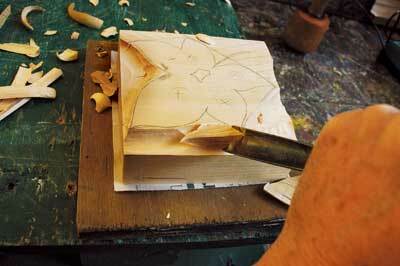 Carry on from this junction into the major stem and carve this. Be aware that the line from every leaf tip should run smoothly all way through the junction to the end of this stem. 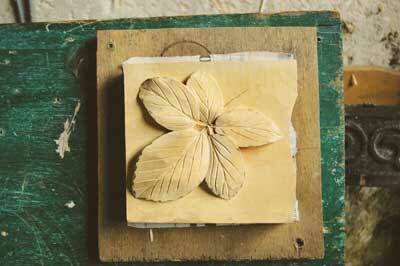 Carve in the rest of the leaf veins. If you are really confident with the veining just go for it, if not, draw pencil lines onto the wood. If the gouge digs in a little bit and a small piece of wood breaks off, change the angle of cut slightly but keep going - this often leads to lively carving. 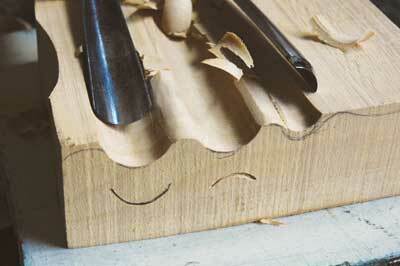 Turn over the wood between the veins with a flat gouge if it fits the design. 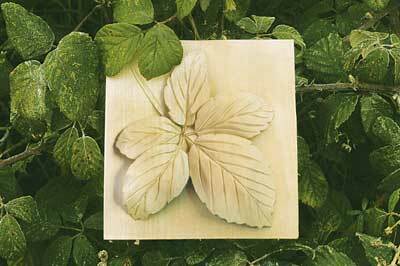 Look carefully at the outside edge of the real leaves and then draw a slightly stylised version onto your woodcarving. I have not drawn round every leaf, nor have I been overly careful in trying to keep them all the same. 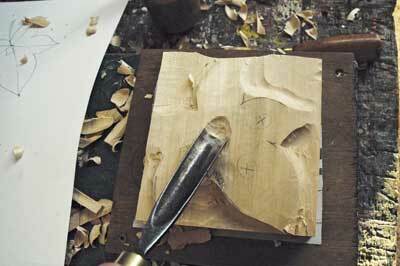 The outside edge is then cut in using a skewed chisel, using a kind of rounded chip cut. 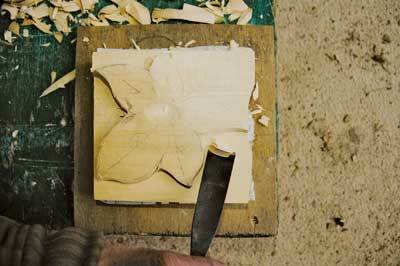 At this stage, I would look at the overall carving and very quickly undercut where I felt it is necessary. 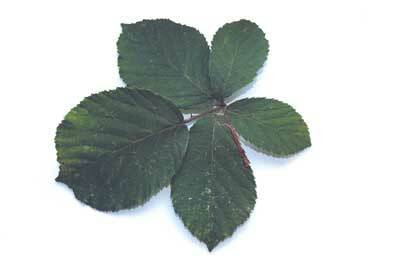 All that's left to do now is to finish your bramble leaves - how you do this is entirely up to you. You may wish to leave it in its natural form, or apply 2-3 coats of finishing oil with a brush or cloth. I chose to keep mine unfinished in its natural form. 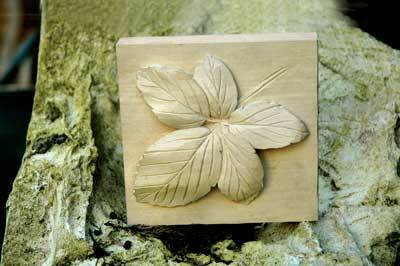 Once dry, it is ready to find a home somewhere on a wall, or as part of an outdoor feature. Enjoy! Each sketch should take no longer than five minutes, less if possible. I would recommend, however, that a large number of these sketches are produced, thus meaning the leaves you are carving become very familiar to you.